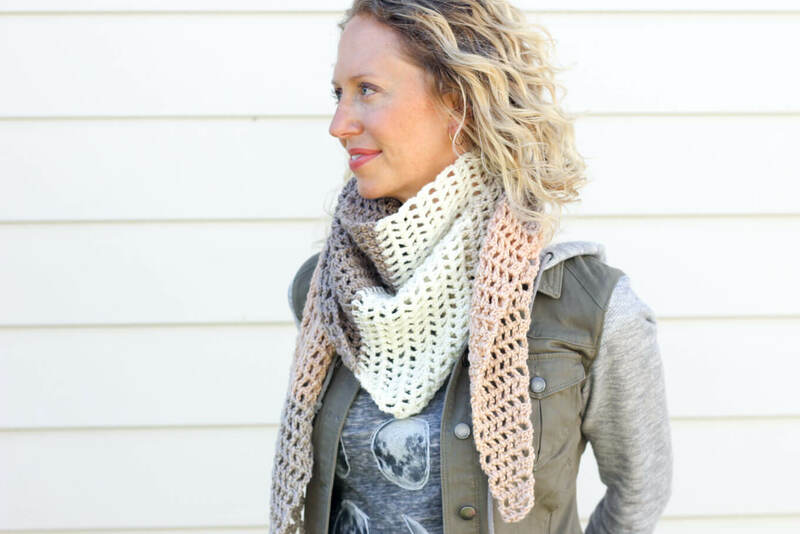 This free crochet cowl pattern uses the herringbone double crochet stitch to create a deliciously chunky scarf with a modern look! As always, the free pattern is below or you can purchase the ad-free, printable PDF for $2.75 here. 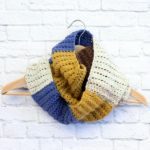 This herringbone crochet cowl pattern is a collaboration with Lion Brand Yarn. This post contains affiliate links. 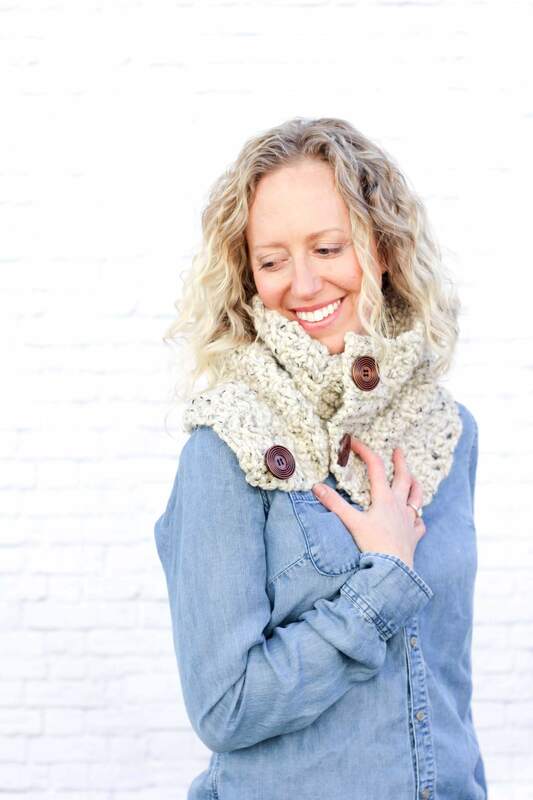 The way I see it, the Bixby Cowl might just be the Julia Roberts of yarn crafts. 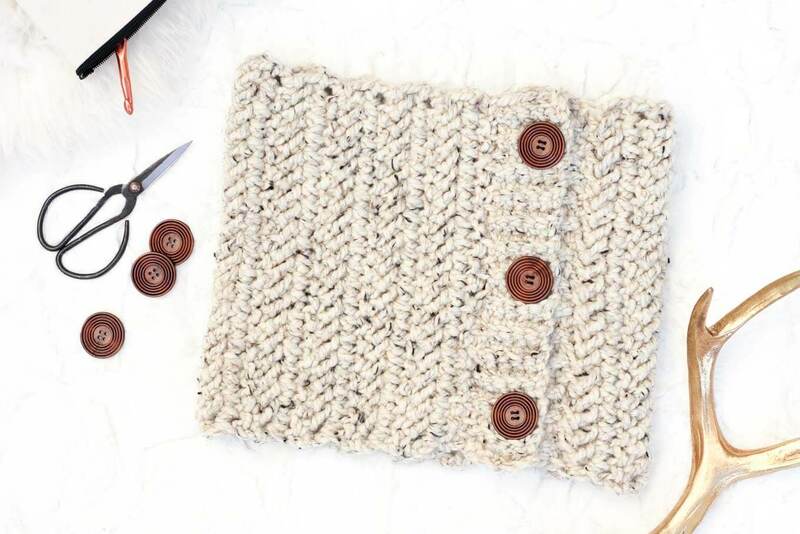 It’s modern herringbone stitch means it fits right in in “Notting Hill.” It’s earthy oatmeal color and wooden buttons means its equally at home in “Erin Brockovich.” And in my opinion, it would look damn good playing opposite Richard Gere. 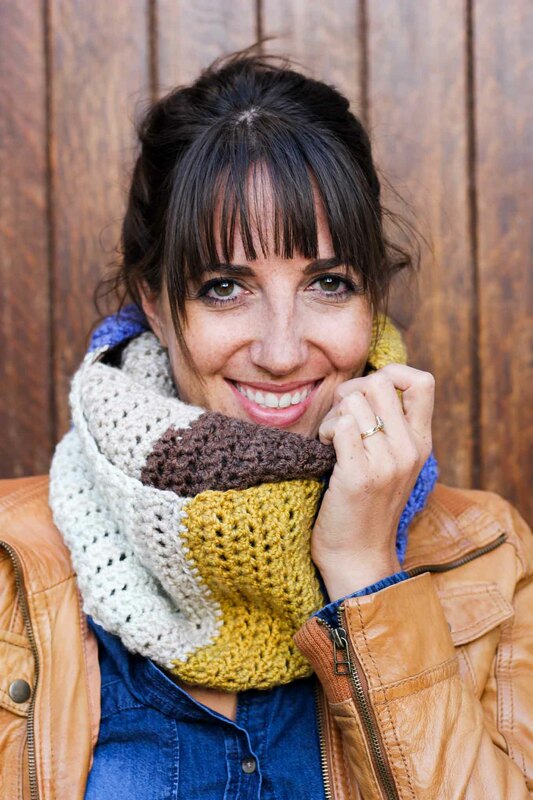 This is one versatile and classic chunky cowl. And guys, it’s so easy to make. 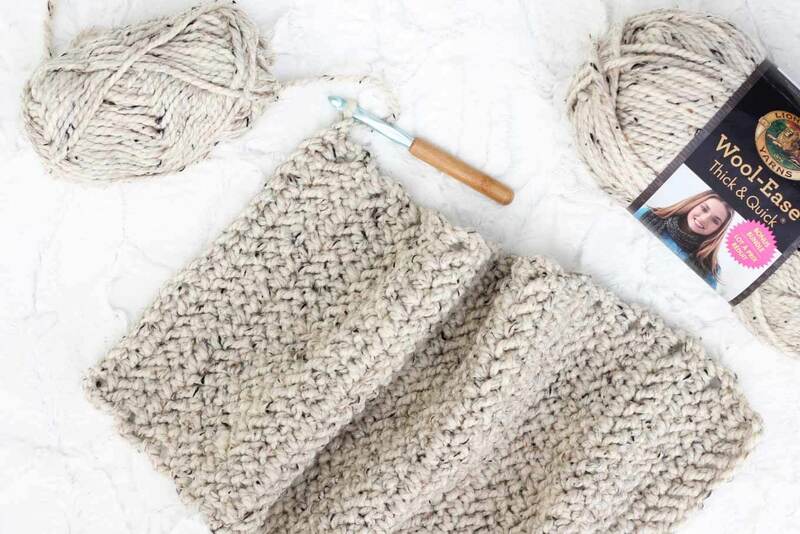 I love how the texture of the herringbone double crochet stitch comes through in my perennial favorite chunky yarn–Lion Brand Wool-Ease Thick & Quick. Isn’t it squishy and scrumptious? I’m including the video tutorial for the herringbone double crochet stitch below, but make sure to click over to the full post for all the details on why you might want to adjust your number of turning chains and examples of how it looks when you do. Feel free to share and pin this blog post! Please do not publish this pattern as your own. You may make items to sell with this pattern. In exchange, please link back to this post. Do NOT use my photos as your own sales photos. ­­You can read my policies here. Now let’s make something awesome! Purchase the ad-free, printable PDF of this pattern for $2.75 here. Add this pattern to your Ravelry favorites or queue here. 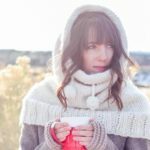 So you can spend more time making cowls and less time shopping, this pattern contains affiliate links at no extra cost to you. 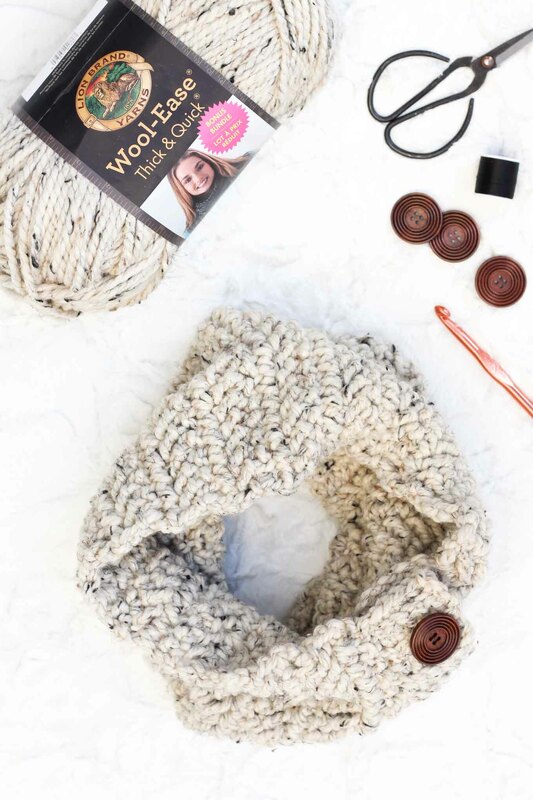 • The main body of the cowl is worked separately from the ribbing. The ribbing is attached afterward with a mattress stitch. 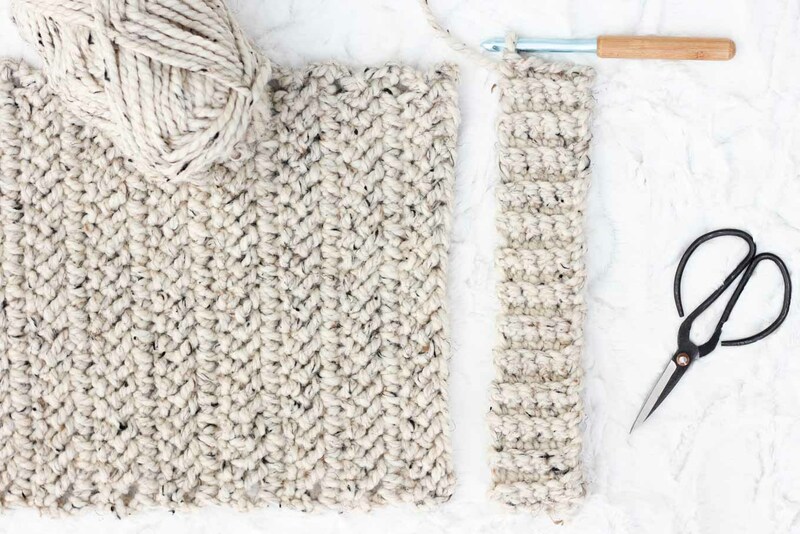 • If you’re having any trouble with the hbdc stitch or just want a more detailed instructions, view the tutorial post and video here. Notes: Be sure to work the last hbdc into the top of the turning chain to keep the edge of the cowl straight. Row 2: Ch 2 (counts as 1 dc), sk first st, 1 hbdc in next and every hbdc to end of row, working last hbdc in tch; turn. Repeat until piece measures 25” (approx. 31 rows total). Fasten off. Repeat row 2 to create a total of 26 rows of ribbing. Fasten off leaving a 24” tail to attach ribbing to cowl. Rows 15-22: Repeat row 2. Rows 24-26: Repeat row 2. Using the mattress stitch, sew ribbing along the short edges of the main cowl piece. (See mattress stitch video tutorial here. Note that for this instance, instead of sewing only through one loop of each stitch as I am in the video, you should sew through both loops of each stitch.) Weave in ends. 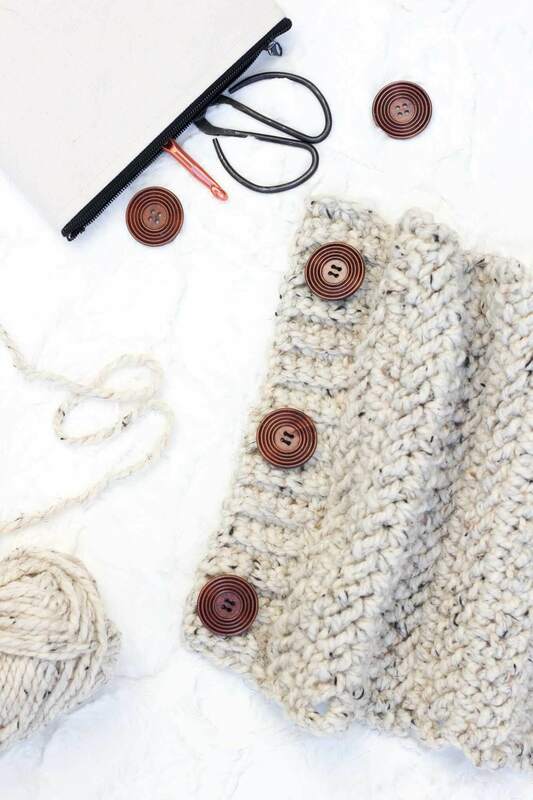 With a sewing needle and thread, sew the buttons in place on the non-button hole ribbing. 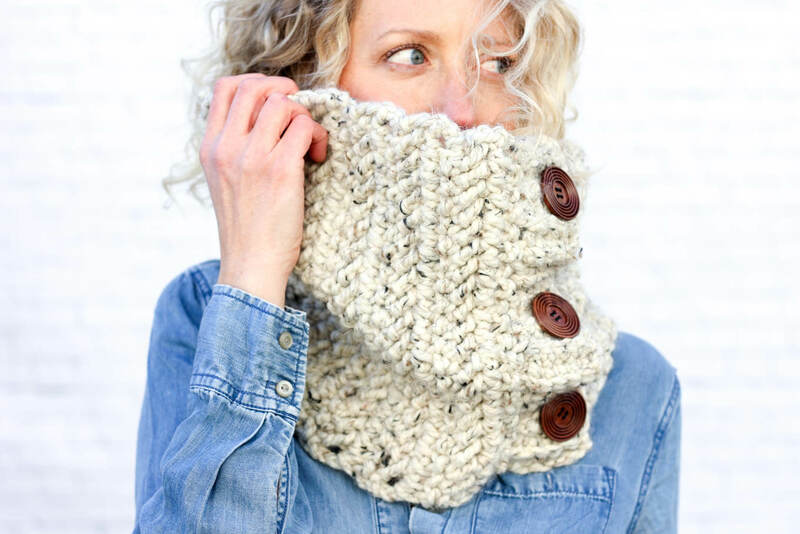 Throw on your squishy new cowl and head to dinner, the opera or the corner store! 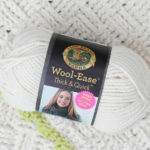 Thanks to Lion Brand Yarn for sponsoring this post and enabling more free patterns on Make & Do Crew. All opinions and ideas are my own. 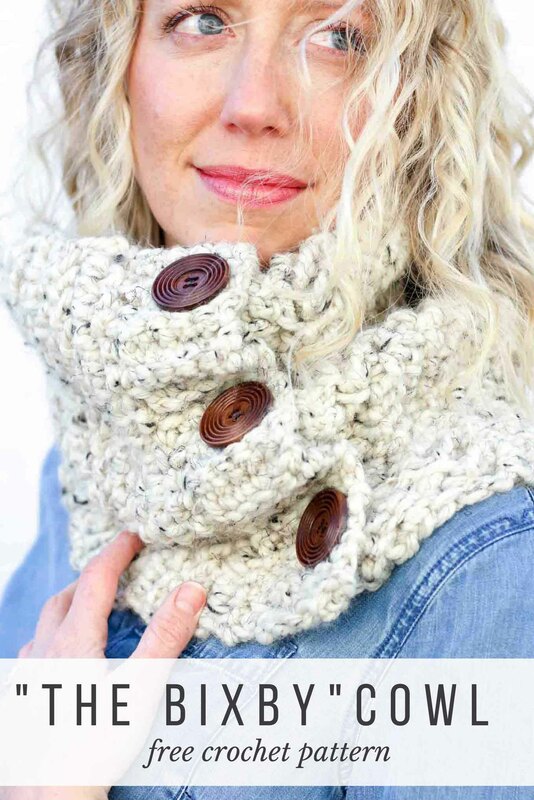 I have a question…I want to make the bixby cowl but I don’t have a size M hook..can I use a N? Yes, you totally could use an N! They’re only one mm different so you should essentially end up with the same result. Stay cozy in the PNW! I love it there. 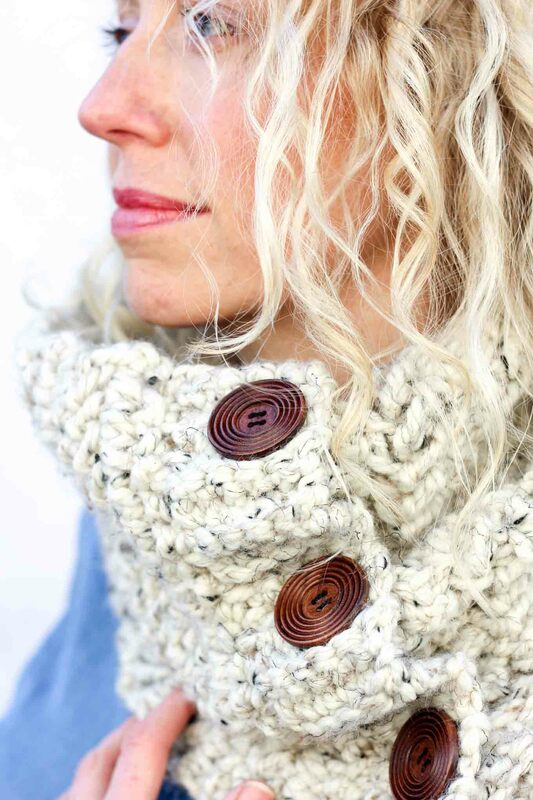 Great cowl – I love the wood buttons. I think I actually have those same buttons in my button stash and have used one for a knit scarf.